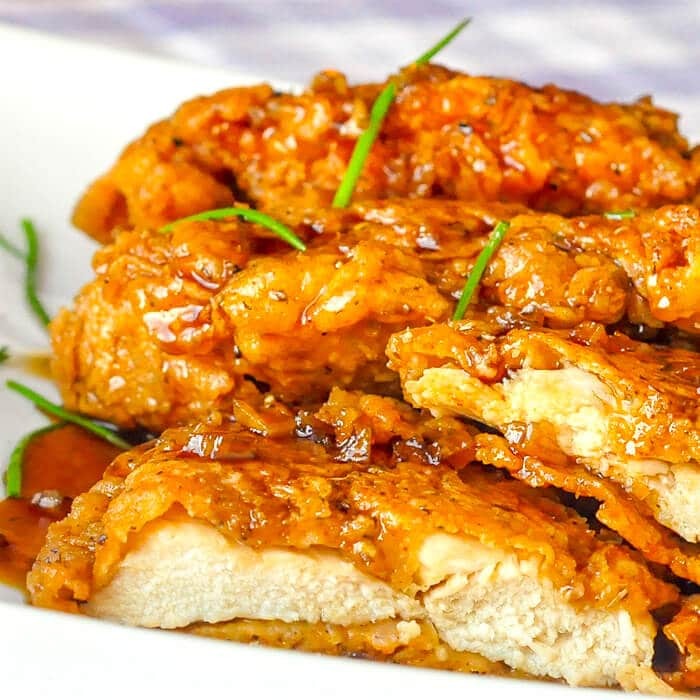 Double Crunch Honey Garlic Chicken Breasts. Rock Recipes NUMBER ONE recipe of all time. There is an excellent reason why this recipe has been seen millions of times online! It has been among the most commented upon and possibly the most raved about a recipe I have ever posted too and for the perfect reason. It seems everyone who tried them loved them and made them over and over again. So many readers have sent thanks for this recipe and shared it with their friends, declaring that it had become a new favorite in their family and had become a permanent fixture in their dinner planning menus. Many readers also shared that they had tried this recipe with chicken breasts as well, as we often do in my family and on the occasion of the first anniversary of the recipe’s publication, we decided to prepare the chicken version and snap a new photo for the blog. 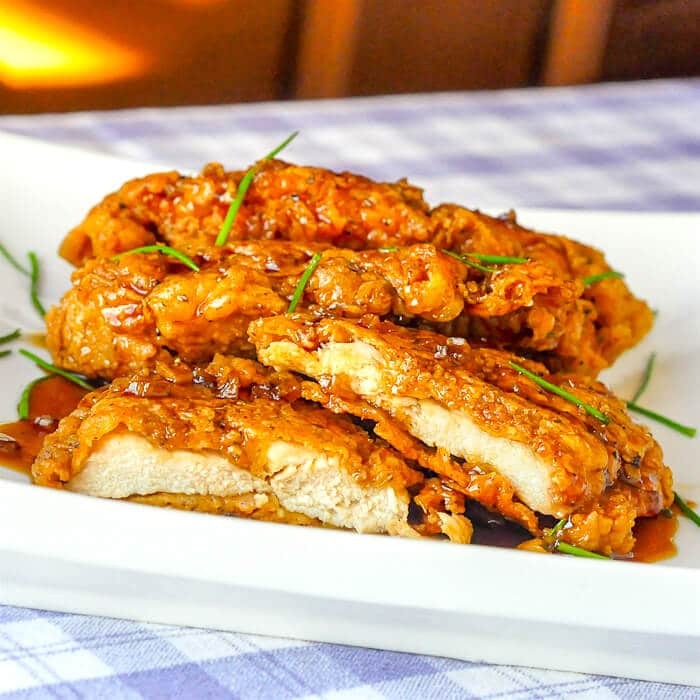 Because the chicken breasts are pounded out to a 1/2 inch thickness, they fry up even faster than the pork chops while still providing a juicy chicken interior and a super crunchy exterior that has been such a big reason for this recipe’s popularity. A quick dip in the easily prepared honey garlic sauce adds a sweet and slightly salty finish that everyone just loves. Place the chicken breasts between 2 sheets of plastic wrap and using a meat mallet, pound the meat to an even 1/2 inch thickness. Alternatively, you can slice the breasts by placing them flat on a cutting board and using a very sharp knife to slice them into halves horizontally. Sift together the flour, salt, black pepper, ground ginger, nutmeg, thyme, sage paprika and cayenne pepper. NOTE: This flour and spice dredge mix is sufficient for two batches of this chicken recipe so divide the batch and store 1/2 in a Ziploc bag in the freezer. I always like to make enough for next time...and there's always a next time with this recipe. Make an egg wash by whisking together the eggs and water. Season the chicken breasts with salt and pepper, then dip the meat in the flour and spice mixture. Dip the breast into the eggwash and then a final time into the flour and spice mix, pressing the mix into the meat to get good contact. Heat a skillet on the stove with about a half inch of canola oil covering the bottom. You will want to carefully regulate the temperature here so that the chicken does not brown too quickly. The thinness of the breast meat practically guarantees that it will be fully cooked by the time the outside is browned. I find just below medium heat works well. I use a burner setting of about 4 1/2 out of 10 on the dial and fry them gently for about 4 or 5 minutes per side until golden brown and crispy. Drain on a wire rack for a couple of minutes before dipping the cooked breasts into the Honey Garlic Sauce. Serve with noodles or rice. In a medium saucepan add the 2 tbsp olive oil and minced garlic. Cook over medium heat to soften the garlic but do not let it brown. Follow the recipe exactly as for the fried version but while you are preparing the chicken, heat a baking sheet in a 425F degree oven. Preheating the pan does 2 things; it prevents the chicken from sticking to the pan and it ensures that the heat from the oven starts going directly into the crust on the chicken to make sure it becomes crispy. Dip all your chicken pieces and coat as instructed. As you finish individual pieces, lay them out on a lightly floured cutting board while you finish getting them all ready. When the pieces are all ready, take the hot pan from the oven and lightly oil the bottom of the baking pan with canola oil or other vegetable oil. Use only enough to coat the bottom of the pan. Working as quickly as possible, transfer the chicken pieces to the oiled pan. Do not crowd the pieces together. They should NOT touch each other or they will steam and not get crispy. Leave at least an inch of space between all pieces. Lightly spray the tops of the chicken pieces with vegetable oil. I recommend that you have a spray bottle filled with canola oil to use in any oven fried recipe for chicken, including this one. A simple pump bottle will do. Spraying the tops helps them start to get crispy in the hot oven too. Maintain the heat at 425 degrees F and place baking sheet in the oven. I use the second lowest rack in my oven. Bake for 15 minutes without opening the door! Take the pan out of the oven and flip all of the chicken pieces over. Return to the oven for another 10-15 minutes until the chicken pieces brown nicely and become crispy. Again don't open the door, maintaining a hot oven is important for this method. Dip the baked pieces in the sauce as usual and serve immediately. This entry was posted in All, Dinner, Healthy Meals. Bookmark the permalink.